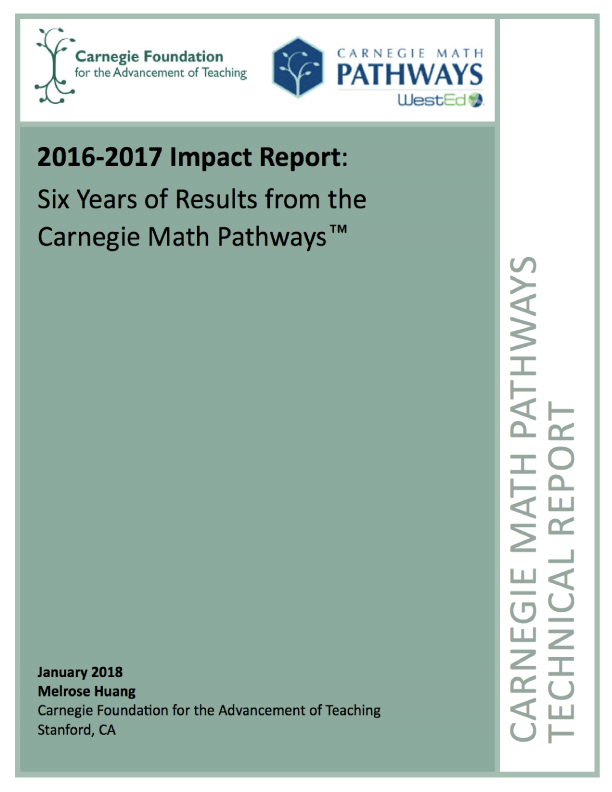 Since launching in 2011, the Carnegie Math Pathways have demonstrated consistently and significantly higher success rates than the traditional course sequence in college-level developmental mathematics. In 2016-2017, Pathways success rates increased further, even as the program served nearly five times as many students as in its first year. Strikingly, the Pathways managed to uphold these results while expanding its reach to an increasingly diverse range of contexts, suggesting that improvement science has ensured the initiative’s effectiveness, even as it spreads and scales. Overall, year six results reinforce the existing evidence that the Pathways can help large numbers of students across an array of contexts acquire mathematics knowledge in pursuit of their academic and career goals. This report provides descriptive statistics for 2016-2017 student outcomes as well as insights into potential areas for improvement, based on data from the Pathways’ sixth year of implementation. For questions or to learn more about Joining the Pathways, contact us. Are you a student? Need help? Contact us for support.